Hazrat Imam Mahdi (A.S.) is the twelfth and last of the chain of the Purified Imams (A.S.) and the divine successors. 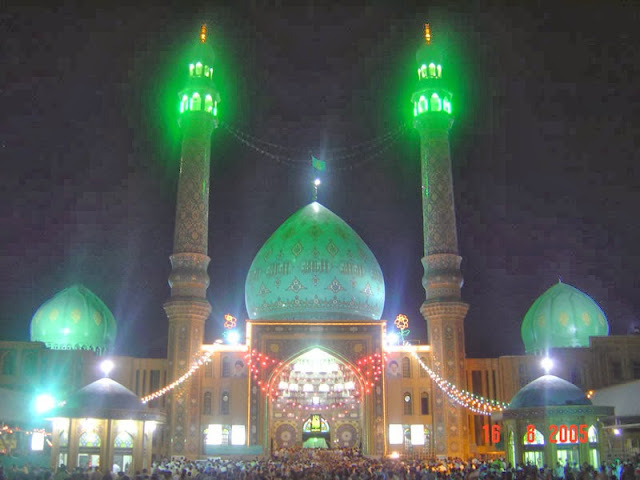 He was bom at the time of dawn, on Friday the 15th of Shaban 255 A.H. in the city of Samarrah (Kamaaluddin vol. 2, Pg. 428, 433 424, 430). His respected father is Imam Hasan al-Askari (A.S.). His beloved mother is Janab-e-Nargis Khatoon (R.A.). She was the descendant of the caeser of Rome from her father's side and from her mother's side she had descended from shamoon the vicegerant of Hazrat Isa (A.S.) (Kamaaluddin vol.2 Pg. 420, 424,). Ibn Khallikaan writes; "His well-known title is Hujjat. The shias know him by the titles, Montazar, Qaem and Mahdi" (Wafayatui Ayaan vol.4 Pg 176). The great scholar Mohaddith-e-Noori has collected 182 titles of Imam Mahdi (A.S.) from the Islamic texts. Each of these titles signify each of his virtuous qualities. (Najm-us-saaqib Pg. 41-98). The tyrant Abbasid rulers were aware of the prophecies of the Holy Prophet (S.A.W.S.). That the son of Imam Hasan al-Askari (A.S.) by the name of Mahdi will appear to remove all kinds of corruption and tyranny. Hence they planned to eliminate the child when he is bom. Due to this the birth of Imam Mahdi (A.S.) was kept a secret like that of Hazrat Ibrahim (A.S.). So much so that except for the most trusted of the shias and his own family, no one knew of the existence of Hazrat (A.S.). Inspite of this whenever there was an opportunity, Imam Hasan al-Askari (A.S.) showed his son to his trustworthy followers; that in future they may follow him. This was in order that the shias may remain firm upon the right path, and not be led astray. After this tragic event the responsibility of guiding the shias was transferred upon him. At this time, Hazrat (A.S.) possessed all the qualities and the divine knowledge that was bestowed upon the previous Imams (A.S.), by the Almighty. In the same way as Hazrat Yahya (A.S.) in his childhood and Hazrat Isa (A.S.) in his infancy was favoured with the divine office of Prophethood by Allah. Although all the Imams (A.S.) were holding the divine office of wilayat, the efforts of the enemies to eliminate the twelfth Imam (A.S.) were maximum. Hence Imam-e-Zamana (A.S.) was entrusted to ghaibat and being away from the sight of people, he had to fulfill all the duties of an Imam. (Sura Maryam: 48-49), Hazrat Musa (A.S.) (Sura Qasas:21-22) and Hazrat Isa (A.S.) (Sura Nisa: 157). The Holy Prophet (S.A.W.S.) and the Imams (A.S.) had pointed out to the people the imminent occultation of their last proof (Imam Mahdi A.S). So that no doubt or misunderstanding should remain, regarding this problem. The occultation (Ghaibat) of the twelfth Imam consists ,of two phases. One is Ghaibat-e-Sughra (The lesser occultation) and the second is Ghaibat-e-Kubra (The greater occultation). Because, even in those early years, Hazrat (A.S.) was concealed from the common people. According to this method, the period of ghaibat-e-sugra comes to seventy four years. During the period of ghaibat-e-sugra. Imam Mahdi (A.S.) himself appointed his deputies from among the righteous shias. Four of them succeeded each other and continued to fulfill the duty of intermediaries. These four personalities conveyed the questions and problems to Imam (A.S.) and brought back the Imam's (A.S.) answers for the people. "He is your Imam after me. And my successor upon you. Obey him, and do not go astray after me (after my death), otherwise your religion shall be destroyed and you will be annihilated. Know that, after today you shall not see him, even if you spend your whole life for it. Hence, accept what Usman tells you, obey his commands and listen to what he says. Because he is the representative of your Imam and holds the responsibility. After the death of Usman bin Saeed, his pious son, Muhammad bin Usman succeeded his father upon the post of the deputyship of Imam-e-Zamana (A.S.) (Ghaibat-e-Tusi Pg. 362). Shaikh Tusi has recorded the letters sent by Imam Hasan al Askari (A.S.) and Imam Mahdi (A.S.) to Usman bin Saeed and his son Abu Jafar Mohammed ibne Usman for the shias. These letters consists of commands, prohibitions and replies to the questions of the shias. Mohammed ibne Usman passed away from this world at the end of Jamadi-ul-Awwal in the year 304 or 305 A.H.
Husain Ibn Ruh Nawbakhti was. one of the agents of Muhammed ibn Usman in Baghdad. He had been working closely with him for a long time. These agents used to be in contact with the people and when ordered they handed over the goods to them (Gaibat-e-Tusi Pg. 369/372). Husain ibn Ruh died in Shaban 326 A.H (Ghaibat-e-Tusi Pg. 387). (Ghaibat -e- Tusi Pgs. 358, 366. 376, 396). The most sensitive and crucial period of ghaibat-e-sugra was when Ali Ibn Mohammad died. Because till his death the people were is contact with Imam-e-Zamana (A.S.) through him. After his death, it was the commencement of Ghaibat-e-Kubra. "...so be prepared, but appoint no one in your place, because from the day of your death, the period of my major occupation (Gaibatui Kubra) will begin. Henceforth, no one mil see me, unless and until Allah makes me appear. My reappearance will take place after a very long time, when the world will be full of injustice and violence". Ultimately, the shining sun of the divine proof went behind the curtain of Ghaibat, completely. And the period of communication with Hazrat (through Nawab-e-Arba) came to an end. Inspite of this (his Ghaibat) Hazrat Mahdi (A.S.) is the Imam of the time and Imam of the world. He is the Divine Proof. Even though his person may be hidden from our eyes but his commands are clear. "Even if the person of the Divine Proof is hidden while he guides the people, his knowledge and manners will be clear for them to follow"
"I leave behind two weighty things among you: The Book of Allah and my Progeny, my Ahlul Bayt If you adhere to those two you shall not go astray. And know that these two shall not separate till they meet me at Hauz (Kauthar)"
During the period of Ghaibat-e-Kubra, when it is not possible to establish communication with Imam-e-Zamana (A.S.) at will, the people have been ordered to follow the true teachings of the Quran and Ahlul Bayt (A.S.) through the pious and religious scholars and the just jurists. The people must follow them to know what obligations they are supposed to fulfill. "And among jurists (Fuqaha) are those who protect their selves (from sins) guard their religion, defy their carnal desires and are obedient to their master. It is incumbent upon the people to follow them. Such characteristics are found only in a few of them (Shias) and not all". The jurists issue decrees for the people and explain to them truth about faith. They endeavour to fulfill the exalted duty of preparing the grounds for the reappearance of their master, Hazrat Mahdi (A.S.). So that by the coming of Hazrat (A.S.) the Islamic faith may strengthen and that he may fill the earth with justice and equity. "The earth shall never be devoid of the Divine Proof, He may be apparent and prominent or he may be concealed and hidden. And it is because of him that the proofs and signs of Allah are not wasted." "The (Divine) Proof was existing before creation (of other things), during creation and after creation". Imam Jafar as Sadiq (A.S.) said. "Because Allah is great and mighty, He has never made the earth devoid of a just Imam". "Even if two people remain on the earth. One of them shall be a Hujjat upon the other. And if one of them dies, it will be the Hujjat that remains". "Certainly, the earth shall never be devoid of one of us. Imams". "I asked Abu Mohammed Al Hasan bin Ali (A.S.) when I was in his presence, regarding the saying of his forefathers (A.S.) that, 'The earth shall never be devoid of Allah's proof upon His creatures till the day of quiyamat. And certainly one who dies without recognising the Imam of his time, dies the death of Ignorance". He (A.S.) said, "This is as true as the bright morning". "O son of the Prophet (S.A), then who is the Hujjat and the Imam after you?". "My son, Muhammed. He is the Imam and the Hujjat after me. One who dies without recognising him, dies the death of Ignorance". According to Imam Jafar as Sadiq (A.S.)the death of ignorance is the death in a deviated and astrayed condition. The importance of recognising the Imam of the time is also clear from the following tradition. When Zurarah asked Imam Jafar as Sadiq (A.S.), "What should I do if I reach the time of his ghaibat ?". 'O Allah, make me recognise Your Self. Certainly if You do not make me recognise Your Self, I will not recognise Your Messenger. O Allah make me recognise Your Prophet. Certainly if you do not make me recognise Your Prophet, I will not recognise Your Hujjat. O Allah ! make me recognise Your Hujjat. "One who disbelieves in the Qaem from my sons, disbelieves in me." "The Qaem is from my Progeny (sons). His name is my name. And his kunniyat (agnomen) is my kunniyat. And his appearance is (like) my appearance. And his behaviour is (like) my behaviour. He will establish among the people my practice and my shariat. And he will call them towards the book of his Lord, the High and the Mighty. One who obeys him has obeyed me. And one who denies his 'ghaibat' has denied me." "One who believes in all Imams (A.S.) from my forefathers and my sons, but denies Al Mahdi from my sons. He is like the one who believes in all the Prophets and denies Muhammad, sallallaho Alaihe wa Aalehi." "Al Mahdi is from us, Ahlul Bayt." "Certainly, Ali Ibne Abi Talib Alaihis salaam is the Imam of my ummat and my vicegerant upon them after me. And of his sons is Al Qaem, Al Montazar. One, through whom Allah will fill the earth will justice and equity like it would have been filled with injustice and tyranny." "Al Mahdi is from the sons of Fatima." "Even if one day remains for this world (to come to an end) Allah will prolong that day until he sends a man from my progeny (sons). His name shall be (like) my name." Salman asked, "From which of your sons, O Prophet of Allah? "He (SA.W.S.) replied, "From this son of mine", and thumped his hands upon Husain (A.S.)"
"Inform me as to who is your successor? Because every Prophet had a successor and our Prophet Musa Ibne Imran (A.S.) had designated Yusha Bin Nun as his successor." The Holy Prophet (S.A.W.S.) replied, "Yes my Vasi and the caliph after me is Ali bin Abi Talib and after him my grandsons Hasan and Husain, followed by nine of the offsprings of Husain. They are the holy Imams." The Jew said, "O Muhammed, tell me their names." 'Yes,' said the Prophet (S.A.W.S. ), "When Husain will pass away, then his son Ali, and after Ali his son Muhammed and after Muhammed his son Jafar and after Jafar his son Musa and after Musa his son Ali and after Ali, his son Muhammed and after Muhammed his son Ali after Ali his son Hasan and after Hasan his son Hujjat Ibnul Hasan. These are the twelve Imams. Their number is equal to the chiefs of Bani Israel"
"Al Mahdi is from my progeny. His name is the same as my name. And his kunniyat is the same as my kunniyat. In his physique and character he looks exactly like me. He will be in a state of occultation and there will be confusion (Hayra) in which people will wander about (deviate). Then he will come forth like a sharpy shooting star to fill the earth will justice and equity as it was filled before with injustice and inequity." "Certainly in the Qaem of the Progeny of Muhammed (S.A.W.S.) is the similarity to five prophets, Yunus bin Mutah, and Yusuf bin Yaqoob, and Musa, and Isa and Muhammed, salawatullahe Alaihim"
Thus, his similarity to Yunus bin Mutha is his reappearance after Ghaibat. He looked like a young man inspite of his advanced age. And, his similarity with Yusuf bin Yaqoob (A.S.) is his ghaibat when he was away from the sight of the general, as well as the special people; due to the fear of his brothers. His affair was hidden from his father. And in such a condition when there was no distance between his father and family and his friends. And his similarity with Musa (A.S.) is persistent fear, and his prolonged ghaibat and a secret birth, and the feverent pleas of his shias after him, and his return by the permission of Allah, and his assistance by the people in subduing of the enemy. And his similarity to Isa (A.S.) is the controversy among the people with regard to him. A group of them says; 'He is not yet bom.' Another group says, "He is dead* and some say: "He was killed and crucified,"
And his similarity with his own grandfather, Mustafa (S.A.W.S. ), is his advent with the sword. He shall slay the enemies of Allah and the Holy Prophet (S.A.W.S. ), and the unjust, and the tyrants." "In the Qaem is a similarity to Nuh (AS.) and that is his long life." "Certainly', when the Qaem from among us shall arise, he will not have the allegience of any one upon his neck. It is for this reason that his birth is secret and his person is in Ghaibat." It must be mentioned that all of our Imams had to pledge allegience to every tyrant ruler except for a short period during the rule of Umar ibne Abdul Aziz. This was because, on the face of it, it would seem that they are not against the ruler, In this way they could protect Islam. In the absence of popular support, the Imams were left alone and thus they entered into an understanding with the rulers. Thus even Imam Husain (A.S.) for a particular period did not find it necessary to revolt against the regime of Muawiya. "Verily each of my ancestors had the oath of allegience, upon their necks, of their contemporary tyrant rulers. But I will reappear at such a time that I will not have any tyrant's allegience upon my neck." trial through which Allah, the Almighty tests His servants." "The Qaem is the one who will purify the earth from the enemies of Allah, the High and the Mighty. And he will fill the earth will justice and equity just as it is filled with injustice and tyranny. He is the fifth of my descendants. He will go into occultation due to the fear of his own (life)." According to common sense it is necessary for man not to throw away his precious life without a legitimate aim. Thus, the prophets (A.S.) and the Imams (A.S.) have taught the people that it is their duty to protect their life under every circumstance and should never put their life in danger. Therefore it is the duty of the last of these exalted personalities to protect himself till the time of his reappearance when he will establish the new world order. 4. Weakness and Lack of Co-operation of the People. "If our shias; may Allah help them in His obedience; would have fulfilled their covenant with united hearts then there would have. been no delay in our meeting, and they would have been blessed with our visitation at the earliest, along with the recognition of truth and confirmation of our rights." "As for deriving benefit from me in my occupation, (it) is like deriving benefit from the sun when it hides behind the clouds." Favours of Imam Mahdi (A.S.) Upon His Shias. "Surely, we do not neglect your condition nor are we forgetful of your remembrance. Had it not been so, then, terrible calamities would have struck you and your enemies would have destroyed you." "The best worship is to await for the reappearance." "Await for the reappearance and do not despair of the divine mercy. Because the best deed in the eyes of Allah, the Great and the Mighty is to wait for the Reappearance. It is the duty of those who are believers." "The greatest success is to wait for the reappearance"
"Those of you who die on this affair (shia faith) while you are in a condition of awaiting, are like those who has served the Qaem (A.S.) in his tent." "Certainly the Qaem from among us is the Mahdi. Awaiting for whom is obligatory during (his) ghaibat and obeying him is obligatory after his reappearance. And he is the third of my descendants." "One who desires to be among the companions of the Qaem, must await, adopt piety and behave courteously. If he dies in such a condition before the advent of Qaem, then his reward will be similar to the one who attains his era. Hence, congratulations to you all for your relentless awaiting." "0 You who believe! be patient and excel in patience and remain steadfast and be careful of (your duty to ) Allah, that you may be successful". "Have patience in fulfilling the religious obligations, Excel in patience in facing your enemies. And be in contact with your Imam who is awaited". "If I am able to reach him, I shall serve him for my whole life." "O Ali know that the most strangest of the people of Imaan and the greatest of them in certainty are those people who will be in Aakheruzzamaan (the last period of time). They will not meet the Prophet. And their Imam will be hidden from them. But they will believe (only) due to black upon white." The "black upon white" means the writings on paper. It means that these people will believe in the Quran and the sunnat as recorded in the books, even though they may not see their Imam (A.S.). "Certainty, the master of this affair has an occupation. Then those who are the pious servants of Allah, will hold firmly to their faith". "Blessed are our followers (the shiites) who during the time of occupation (Ghaybah) of the Imam of the Age, identify themselves with our Authority (wilayah) and keep away from our enemies. They belong to us and we belong to them. They have accepted our leadership and we are pleased with their adherence. Therefore, blessed are they. I swear to Allah that they will be with us in our rank in Paradise". It is related from Imam Jafar as-Sadiq (A.S.) that the following dua must be recited during the time of ghaibat. "O Allah ! O Beneficient ! O Merciful ! O the knower of the thoughts (of the hearts) ! make my heart firm upon your religion." "And know that! Those who are obedient and pious will rush towards him like the birds head for their nests." "The most pious of believing men and women are those who are sorrowful for the (time of) flowing water (Imam Mahdi A.S)"
"Say ! Have you considered if your water should go down, who is if then that will bring you flowing water?" "Say, if your Imam (A.S.) goes into ghaibat, who is it that will bring back your Imam to you. Who, like a gushing spring will teach you what is haraam and what is halal, and quench you thirst with good tidings (news) of the sky and the earth." "Know him ! The one who would be hidden from you in your time until it would be said, He is dead! He is killed ! He has gone into wilderness. And the eyes of the believers will be tearful." "By Allah they do not truly wish for his reappearance, and do not attain salvation. Except those, whom Allah the High and the Mighty, has made firm upon the sayings of their Imams, and gave them the tawfeeq (opportunity) to pray for the hastening of the reappearance." "And pray more for an early reappearance. For certainly, in it, is your success." "Even if a single day remains for quiyamat, Allah will send a man from my Ahlul'Bayt. He will fill the earth with justice just like it is filled with tyranny." When I was reciting the Qasida (Panegeric) before my master, Raza (A.S.), I reached to the following lines. “I hope in the advent of my Imam. Who will rise up with the name of Allah and the divine blessings will accompany him. He will separate the truth from falsehood (for us) and he will reward and punish." Imam (A.S.) said to me: . "No my master, I only know that one of you, Imams will rise up and clear the earth of all injustice and fill it will equity." "O Dibil after me my son Muhammad shall be the Imam and after him his son Ali, and after him his son Hasan al Askari, and after him his son Al-Qaim who shall be the awaited one during the period of his ghaibat. And when he shall be revealed, all the world shall bow down to him. Even if a single day remains for this world, Allah the High and the Mighty shall prolong this day till he will appear and fill the earth with justice as it has been filled with tyranny. And who knows when it will come to pass! I have heard it from my father, (who had heard it) from his father, and they had heard it from the Messenger of Allah (S.A.W.S.) when he was asked, "O Prophet of Allah (S.A) when will the Qaem of your progeny arise? "His likeness is to the Hour (Quiyamat), '.....none but He shall manifest it at its time; it will be momentous in the heavens and the earth; it will not come on you but of a sudden'." Holy Prophet (s.a.w.s.) said, "My Caliphs are my legatees and the proofs of Allah upon the creatures, after me they are twelve. The first of them is my brother and the last of them is my (grand) son"
He was asked, "0 Prophet of Allah, which brother of yours"
He replied, "Ali Ibn Abu Talib"
Again he was asked, "And which Son?" "Al Mahdi is the one who will fill the earth with justice and equity just like it had been filled with injustice and tyranny. I swear by the one who has sent me as the giver of good tidings, even is a single day remains for the world (to end), Allah shall prolong that day till he sends (to it) my son Mahdi. Then Ruhullah (spirit) Isa ibne Maryam will descend and perform prayers behind him. The earth shall be illuminated by his radiance and his authority shall stretch from the east to the west." "He will direct desires towards (the path of) guidance while people will have turned guidance towards desires, and he will turn their views to the direction of the Quran while the people will have turned the Quran to their views." "When the Qaem shall arise, he will rule with justice, the tyrants of his time shall fear him, the righteous will be safe, the earth shall reveal its treasures, all the truth-seekers will seek his company and no follower of any religion would remain except that they see Islam and declare their faith in it." "The fourth of my descendants is the son of the chaste maid. Allah shall purify the earth from every atrocity through him and rid it of every injustice. He is the one whose birth shall be doubted. He will have an occupation before his reappearance. When he reappears, the earth will light up with his brilliance. And he will establish the scales of justice among the people. Then, (among men), one will not oppress the other." 23. Muhaddith-E-Noori - Najmus Saaqib.